In-play betting is becoming more and more popular. Often the excitement of watching a game can be enhanced with a bet. Bookmakers know this and they often offer a multitude of markets to bet on in-play. However the majority of the time if you are betting in-play you will find the best value at the betting exchanges. With betting exchanges you also have the option of trading your positions. If I am betting in-play then it is the exchanges that I will normally look to first. Lets take a look at some in-play football betting and trading strategies that can be profitable with the right approach. Laying the draw is a strategy that is used by most newcomers to football trading and is easy to follow. In the past many people used this strategy pre-match. They would lay the draw before the start of a game, wait for a goal to be scored and then hedge all outcomes hopefully for a profit. However as time has gone on this has become a less profitable and less popular strategy. However another option with this strategy is to delay your entry into the trade. Look for games that are level in the second half and then look to lay the draw with the game inplay. Using this strategy you would lower the potential risk level as the draw odds are lower and take a higher profit if a goal is scored. You don’t have to trade out of this position either. Some people are happy to lay the draw in the second half and move on to the next bet. Using this strategy as a straight betting method. Favourite needs to win – I want the favourite to be really pushing for a goal. Perhaps they are second place in the league and a win would put them top. Or maybe its a cup game and they really don’t want to go to a replay. The underdog should show they can counter – If the underdog is just sitting back and soaking up the pressure without countering. Then we may as well just back the favourite if they are the only team that look like scoring. Another strategy that can used exclusively with the betting exchanges is laying the correct score. With this strategy we are looking to bet that there will be at least one more goal in the game. Now if you were to use this strategy pre match you would be laying at pretty high odds. In-play however you can often find good opportunities at much lower odds. In the example above the score was 0-0 after around 60 minutes. Liverpool were the favourites playing at home. They found themselves trailing 0-1 on aggregate in a cup semi final. This meant that Liverpool needed a goal to have any hope of qualification. Liverpool pushed hard for the goal however it was Southampton who scored an injury time winner on the counter attack. What type of conditions are ideal for these types of strategies? Home team favourites are trailing by a goal – When a home team favourite is trailing and time is ticking down you will often see a great sense of urgency. Also the home crowd will often add extra pressure for them to push forward. There is only a one goal difference – When there is only a one goal difference it can make a big psychological difference to a players mentality. One goal seems within achievable even if there is only a few minutes remaining in the game. Game tempo is also a key factor – Is the referee letting the game flow or continually stopping it? Are the leading team looking to counter or happy to sit back? Are tactical changes being made and substitutions? There are a lot approaches you can take when looking to find value in the in-play betting markets. Niche markets can provide great value as they are often overlooked. The corner markets are a favourite for quite a few profitable tipsters that I have seen. Then there are the over/under goals markets, the first half goal markets, total goals, next goal, Asian handicap markets. With so many markets and options available there are countless in-play betting strategies that you can try. You might want to focus on the first half markets? With in-play betting and trading the odds in these markets have to consistently change with the dynamics of the game. This often means there are is a lot of potential value bets to be found with the right research. Where Can I Find Stats For In-Play Betting? If you planning to bet in-play you might want to look at the statistics of previous games.There are a number of really good sites for football statistics. Here some recommendations which are all free to use. My personal favourite is soccerstats. It has a great layout, is easy to use and gives you really great statistical breakdowns. Which you can see from the above screenshot. Where can I get stats for games that have already started? Most bookmakers will provide you a statistical breakdown of a game that they are offering in-play. What you should be aware of is that they might not always be 100% accurate. I would always prefer to have live video for a game that I was intending to bet or trade. As not all shots on target are of the same relevance and possession stats don’t always indicate a teams dominance. However if you can’t get live video. Here are some of my recommendations free sites that give live data on ongoing football matches. When you are looking to bet in-play you might sometimes be in a rush to place your bet. However if you really want to make money from any avenue of betting its important to get the best odds possible. On most occasions you will find this with a betting exchange such as Betfair. But sometimes you may find it with a bookmaker you have access too. 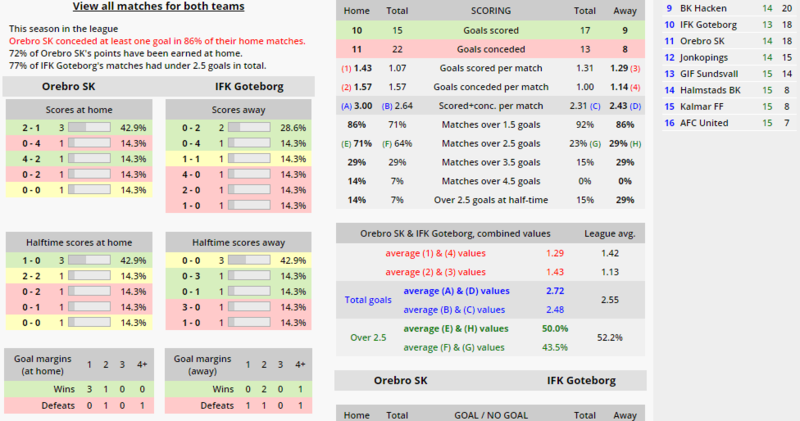 Oddsportal have a live feed for in-play odds which you can use for a quick comparison when betting in-play. Don’t force a bet or trade just because your watching a game. Often you will see bookmakers advertising “Milner to score the next goal at 9.0” during half time. These are exactly the types of bets you don’t want to make. There is a reason a bookmaker is promoting this bet because its terrible value. If you want to find good value in the in-play markets then you will need to do your research. Wait like a sniper and then when everything aligns perfectly enter the market.